Across the street from the Hotel Sagar was a handicrafts shop. I’d read so much that Jaipur was the best and least expensive place for shopping, but I couldn’t resist a look. The showroom only had the cotton block printed bedspread I wanted in a twin size, but they had another showroom less than five minutes away just down the street. 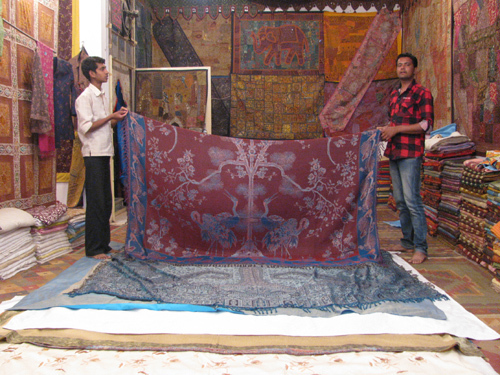 At the second showroom they were more interested in showing me pricey bedspreads than inexpensive cotton ones. They kept saying “No pressure to buy, just for the pleasure of your eyes.” But I knew what they were up to! I was easily able to resist the silks. I have cats. Their next tactic was to entice me with patchworks. I thought I had bought enough patchworks in Mandawa already, but I was so wrong. Seeing these displays, you realize you had to have certain things you never knew you needed before. They quickly wore my resistance down. I’d never seen anything so beautiful. 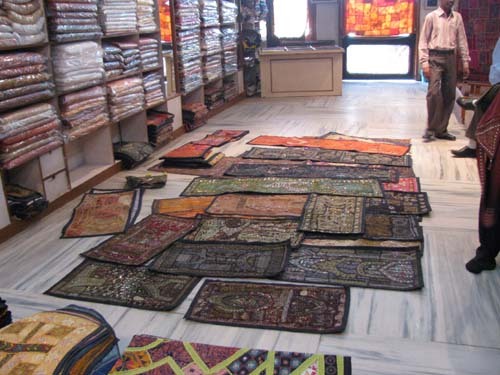 Bikaner Art Emporium is government approved, so prices were fixed. But it didn’t stop the owner from tossing in a couple of freebies once my total hit a certain amount, including free shipping. It was a lot easier to have them deal with shipping than to go out and look for the nearest Fedex or DHL location and pack the items myself. Since they accepted credit cards, it made the decision to buy everything I wanted all that much easier. There was no problem with shipping. Everything arrived a couple of weeks after I got home in perfect condition. 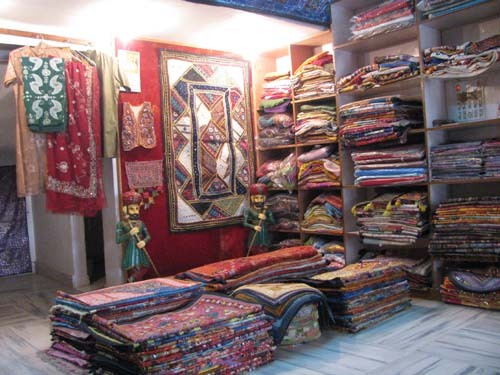 After the walking tour of Mandawa, Shankar asked if I was interested in stopping by a shop to see textiles. I assumed that he had a connection to this shop somehow: either a family member was in the business or perhaps he was getting a commission for bringing tourists there. This is a common practice and shouldn’t automatically be taken as something negative. Shop owners have no way of reaching potential customers other than having a good location where there’s a lot of tourist foot traffic. Guides don’t make much money, and the small commissions they get (one or two percent of the total amount the customer purchased) help them support their families. Although sometimes it happens, guides don’t always take you somewhere you’ll get ripped off pricewise. This shop was government sanctioned, which was a guarantee that tourists wouldn’t be overcharged. Government sanctioned shops have fixed prices. If the guide shows more interest in taking you shopping than sightseeing, then your suspicions are well founded. But Shankar had done a good job showing me around town and tourists do also come to shop, so I thought nothing of it. He showed me to a shop a little ways off the main street. I might not have found it on my own. The store was a kind of co-op that supported women’s needlecrafts. 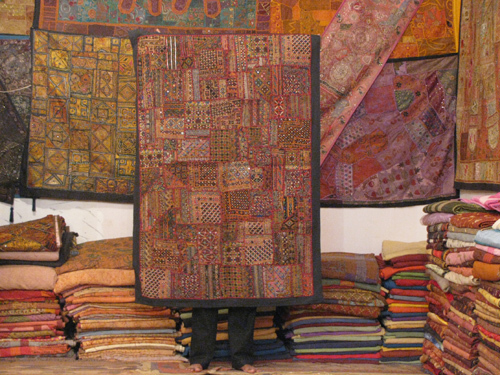 Rajasthan is famous for textiles and fabric crafts, so this was something I definitely was interested in. I asked to see some patchworks. They had a dazzling selection. The most common way to display textiles for the buyer is to unfold them and spread them out on the immaculately clean marble tiled floor. 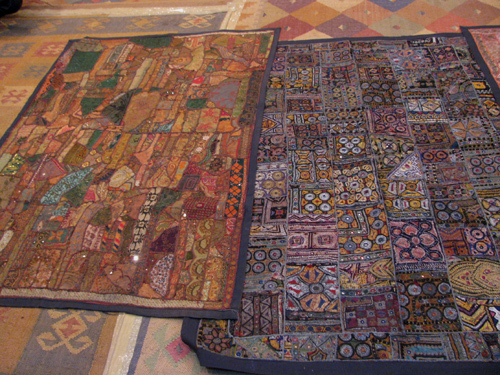 The patchworks were all hand stitched and lavished with embroidery. 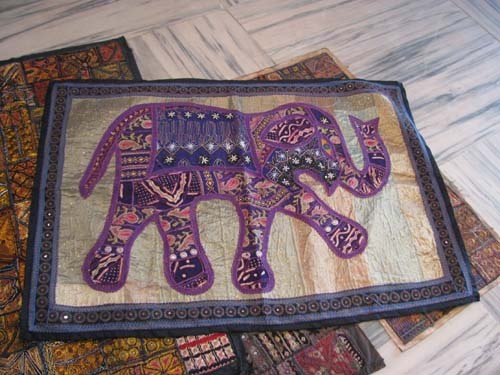 Most of them had metallic threads, and many were beaded, reflecting the Indian woman’s love of all things sparkly. Women can only work two to three hours a day on them. 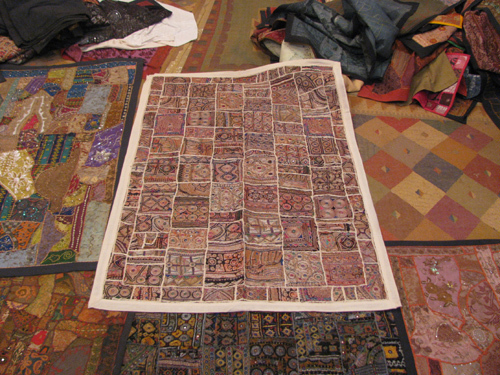 The smaller patchworks take several months to complete. I asked the manager whether the shop has a website, and he said no. He admitted he is a bit old fashioned and prefers to do business face-to-face. 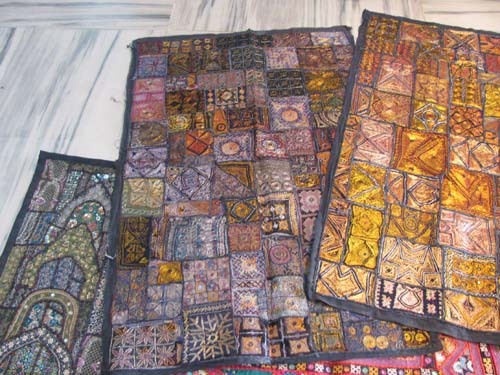 I suggested that people all over the world are interested in handicrafts such as these, but simply showing them a business card wouldn’t stir any interest to buy these items the way seeing an internet photo gallery of these incredible works of art would. He said he would give it some thought. He has a son who is in college learning web design who should be able to help. 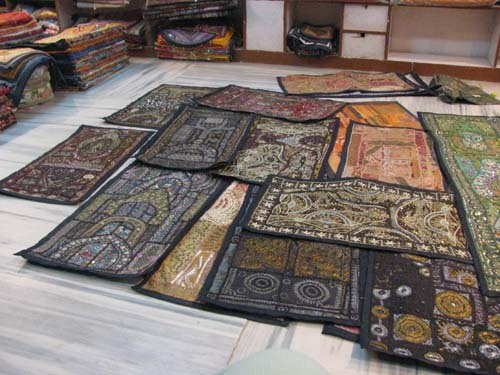 Manufacturers & Exporters of Durries, Handicrafts, Silver, Paintings, Textiles, Hand Embroidered, Blue Pottery, Etc. If you’re going to Mandawa, this is all the information you need. It’s a small town, and anyone you ask on the street could tell you how to get there, despite there being no street address. It’s India, and people are very friendly. Someone will probably even take you there. And by the way, I didn’t leave this shop empty handed!